Please review our FAQs before you hop in the car. All JCakes require special care – both in transportation and storage! In the area? 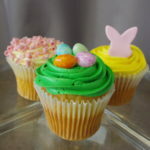 We carry a rotating selection of fresh cupcakes in the shop! JCakes is located on the East Haven/North Branford Town Line next door to Anthony’s John’s Pizza, in the beautiful Farm River Plaza. From New Haven/East Haven – Follow RT 80 East past ShopRite and East Haven High School. JCakes is about a mile from East Haven High School, in a plaza with Absolute Liquor and Anthony John’s Pizza on the right side. From Guilford/Madison – Follow RT 80 West past McDonald’s, Tilcon, and the CT Sportsplex. JCakes is about a half mile from CT Sportsplex, in a plaza with Absolute Liquor and Anthony John’s Pizza on the left side.